The final moments of Rachel Corrie, the American peace activist crushed to death beneath a pile of earth and rubble in the path of an advancing Israeli army bulldozer, were described to an Israeli court by an eyewitness yesterday. The parents of the 23-year-old, who was killed by the bulldozer in March 2003, were present to hear the harrowing account on the first day of hearings in a civil lawsuit they have brought against the state of Israel. The country has never acknowledged culpability over Ms Corrie's death. Richard Purssell, a British activist with the pro-Palestinian International Solidarity Movement (ISM), said he watched in horror as Ms Corrie was dragged four metres by the bulldozer moving forward at a "fast walking pace". What would anyone expect to happen? Also, I'm amazed this is real. Delay may end up denial. More on that below. 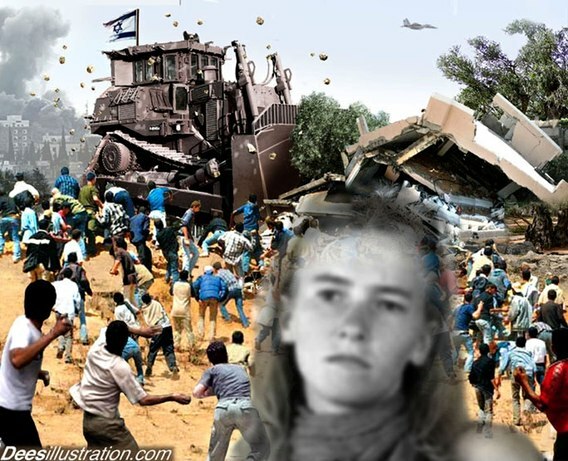 On March 16, 2003, an Israeli bulldozer driver murdered Rachel in cold blood. Trying to stop a Rafah refugee camp home demolition, eye witnesses said she climbed atop the giant Caterpillar tractor, spoke to the driver, climbed down, knelt 10 - 20 meters in front in clear view, and blocked its path with her body. With activists screaming for it to stop, the soldier-operator deliberately crushed her to death. To be sure, he ran over her twice. The Foundation continues what Rachel began. It reflects "her vision, spirit, and creative energy...." It supports "build(ing) understanding, respect, and appreciation for differences, and that promote cooperation within and between local and global communities." "The foundation encourages and supports grassroots efforts in pursuit of human rights and social, economic, and environmental justice, which we view as pre-requisites for world peace." advancing "human rights and social, economic, and environmental justice for all....;"
committing to people and places the way Rachel did, especially those most disadvantaged and repressed. Rachel was 23 when murdered. She believed in nonviolent direct action. She supported oppressed Palestinians. It became her life's struggle. She gave it doing what's right. What greater sacrifice than that! "I’m here for other children. We have got to understand that they are us. We are them. My dream is to stop hunger by the year 2000. My dream is to give the poor a chance. My dream is to save the 40,000 people who die each day. My dream can and will come true if we all look into the future and see the light that shines there. If we ignore hunger, that light will go out. If we all help and work together, it will grow and burn free with the potential of tomorrow." Her dedication and humility came out in comments like "I can't be Picasso. I can't be Jesus. I can't save the planet single-handedly. I can wash dishes." From Occupied Palestine, he emailed often. Her comments showed dedication. They're inspirational for others. They reflect a spirit vital to be kept alive. The Foundation, Rachel's family, friends, and kindred spirits do it. What better life's mission than supporting peace and justice. Rachel died for it. It bears repeating. What greater sacrifice than that! In 2005, representing Rachel's family, attorney Hussein abu Hussein sued the State of Israel. It bears full responsibility for her death. On March 10, 2010, oral testimonies began. Fifteen court hearings were held. Twenty-three witnesses testified. They included four International Solidarity Movement (ISM) activists with Rachel when she died. They saw what happened close up. Over 2,000 court transcript papers were produced. US embassy officials attended each hearing. So did Rachel's family members, as well as numerous international legal and human rights organization observers. On July 11, 2011, proceedings concluded. Judge Oded Gershon scheduled dates for both sides to present written summations and closing arguments. He also set April 23, 2012 for his ruling. Multiple delays along the way postponed it. Rescheduling hasn't been set. The longer it's delayed, the more likely justice will be denied. Whatever the ruling, Rachel's lost life can't be restored. In her absence, her inspirational spirit motivates others to continue her important work. Helping others and pursuing justice defines it. The Rafah City/Rafeh refugee camp Rachel Corrie Clinic and Children's Center performs vital services in her name. The Rachel Corrie Memorial web site provides information about her and what everyone can do. The best way to honor her is follow her example. Support peace and justice issues. What's more important than those. If I email Bibi and ask him nicely if the bulldozer driver who deliberately ran over and crushed Rachel TWICE, be charged with murder? What are my chances? death of American activist Rachel Corrie in Gaza nine years ago, the US ambassador in Tel Aviv has reiterated to her family. If a policeman in the US kills a citizen and it looks suspicious, will that policeman ever be brought up on charges? If a US policeman does anything wrong whatsoever, will that US policeman ever be disciplined or will any action be taken whatsoever? But they will promise a thorough investigation! HA! Same thing everywhere, not just Israel. It's called the Blue Wall here; they might as well call it the Wailing Wall there, because you can cry all you want, but they will never do anything about it. I am sure an equivalent condition exists in all the Muslim countries, probably more so, and would in Palestine, if they had a police force or military. “Between 2000 and 2004, the Israeli military demolished 1,700 homes in Rafah, leaving about 17,000 people homeless, according to the Israeli human rights organisation B’Tselem. If we should love our neighbors as we love ourselves, shouldn’t we say something when the Israeli regime is literally demolishing thousands of Palestinian homes, leaving people homeless? Last edited by Katz; July 3rd, 2014 at 03:19 AM. I think there must be another side to this story. You are for the Palestinians. You should be for the human family. You are always on the side of the Palestinians. You should always be on the side of whoever is wronged. There is something wrong when you are never on the side of Israel, and it is not feasible that Israel is always wrong. It is exactly this warlike point of view that leads to war. Where is the help for the Palestinians from the Muslim side? What Muslim countries are offering them refuge? What do the Muslim countries provide the Palestinians other than guns, missiles and the importation of terrorists to help the cause of war? How long has this been going on? The answer is the same as to the question, "How long has Israel been a nation?" This is anti-British, anti-UN, and anti-American as well as anti-Jew and anti-Israel. Much is made of Jews and of Zionism, but what I see is that anti-Jew and anti-Zionist idividuals may be the real culprits in all of this. Last edited by aslan; July 3rd, 2014 at 02:31 PM. There are a lot of good caring compassionate Jewish and Israeli anti-Zionist activists working hard overtime to put an end to Israel's oppressive apartheid occupation. Through grassroots organizing, education, advocacy, and media, Jewish Voice for Peace works to achieve a lasting peace that recognizes the rights of both Israelis and Palestinians for security and self-determination. Jewish Voice for Peace is the only national Jewish organization that provides a voice for Jews and allies who believe that peace in the Middle East will be achieved through justice and full equality for both Palestinians and Israelis. With offices in New York and California, 100,000 online activists, chapters across the country and an Advisory Board comprised of numerous prominent Jewish thinkers and artists, JVP supports nonviolent efforts here and in Israel-Palestine to end Israel’s Occupation, expand human and civil rights, and implement a US policy based on international law and democracy. I fail to see where anti-Zionism is helpful since it defines Zionism narrowly as a desire to take away what belongs to the Palestinian people. I am sure their are millions upon millions of Zionists who only want Israel to have a secure homeland. They see boundaries as redefined by war as necessary security given the fact that Israel is surrounded by hostile nations that marched against it from its inception, and have continued hostilities against it ever since. They do not espouse a militant Israel that secretly desires to expand its boundaries to fulfill some imagined Biblical prophecy, but only an Israel that wishes to live in peace with its neighbors. This is why I cannot see anti-Zionist rhetoric as helpful in fostering a spirit of mutual cooperation in the region. Anti-Zionists cast all who ardently support an Israeli homeland in the same bag with imperialist Israelis, and that is clearly not a fair characterization of pro-Israel people, who in my opinion most often represent the former. Atzmon: Yes, I can imagine that this is what the Israelis would do when a Palestinian is murdered by Israelis, either military forces or just settlers. They always try to find an outer motive that diverts attention from the murderous and genocidal and plunderous nature of the Jewish state. I don’t like to talk about particularities – I think the situation on the ground is indeed grave – I like to understand how is it possible that the Jewish state that was supposed to launch a beautiful Jewish homecoming to celebrate the new Israelite and to solve the Jewish question managed only to move the Jewish question or the Jewish problem into a new place and this is a disaster. I can’t decide whether I was amused or very sad to hear Richard (Richard Hellman, Press TV guest from Washington) a second ago trying to divert attention and make us look at Iraq and Syria. I think that the situation in Iraq and Syria is very grave, but we have to remember that just a year ago it was the Jewish lobby in America and Israel that pushed to send ammunition to support ISIS and all those very frightening organizations. And I think that we have to start to take a broad look into this topic and to understand that Israel is the biggest threat to world peace and people like Richard and the Jewish lobby in America and Britain and France are actually very dangerous to their nation and to the people around them as well as the planet. Press TV: Your reaction to Richard Hellman’s description of Israel as the only democracy in the Middle East and as a benefit to the world, if only its neighbors would stop wanting to destroy it. Atzmon: I think calling Israel a democracy is slightly pathetic. I’ve heard it many times. I want to remind your viewers that in the ‘Israeli democracy’ half of the people living within Israeli-controlled territories are living in open-air prisons – Gaza is an open air prison and it’s not a state, it’s still under Israeli control as we know; the West Bank is an open air prison and when Israel feels like it – like in the last week – it enters the West Bank, it killed, it arrested. It’s not a democracy, it’s a Jewish democracy and in practice it is a terrorist state. Last edited by Katz; July 3rd, 2014 at 07:44 PM. Are you completely losing your mind? I mean really. Biblical "prophecy", i.e., the foretelling of future events, and your gibberish about genocide, aretwo different things. In case it slipped by you, many Zionists call themselves Zionists because they believe the Bible "prophesies" or predicts that God will restore them to their homeland. These prophecies, however, were already fulfilled in ancient times when God restored Israel from its exile to Babylon. Many evangelical Zionists, like Hal Lindsay, believe these predictions hold true for the present day and that the present country of Israel is the fulfillment of Biblical prophecy. I'd wager to say (not literally) that more Christians believe this than Jews, who merely want to escape the treatment they receive by their unwelcome presence in other countries of the world. What better place to reestablish a national identity than where they once lived as a nation, and the recapture of those lands by the British offered a golden opportunity, which they grasped. As for how their neighbors are treated, what happened in ancient times has no connection with what happens in these modern days. Nowhere in the Bible is it written that Jews must remain hostile to the remnants of the peoples of ancient days, or to be hostile to Islam, a faith that did not even exist in ancient times. In fact, Muslims worship the same God, the God of Abraham, although they see Him differently than the Jews. So, please put the cheese back on your cracker and settle down, won't you. Oy vai iz mir! Last edited by Katz; July 4th, 2014 at 06:05 PM. People of Israel vs State of Israel - The Difference? Death is on the way!